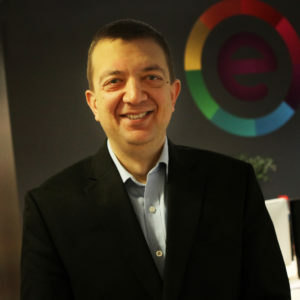 Mr. Murat, Managing Director of ERA (Entrepreneurs Roundtable Accelerator) that one of the biggest accelerators in New York will present a special program. A panel discussion about how accelerators make collaborations between large and venture companies more valuable will be run, and a pitch event by ventures in i-Brain and ICT businesses will be held. Large enterprises in Keihanna region, investors from Japan and U.S., and venture companies will get together here. – Universal Robot co, ltd.
Mr. Murat is a computer scientist, entrepreneur, investor and author. He is the co-founder and Managing Director at ERA, an early-stage investment fund and technology accelerator in New York City since 2011 with a portfolio of 127+ and growing companies.